How Much Do Tornado Shelters Cost? Whether you live in Tornado Valley or you just want to protect your family from the potential of such a storm, tornado shelters can be a life saver. But how much does a shelter cost and what sort of cost factors are at play when having one installed? All of these are important questions you need answers to before starting the project. This way, you'll know whether or not it fits into your budget. How Much Does It Cost To Build a Tornado Shelter? Make sure your tornado shelter is completed by a professional. You and your family's life could depend on it. Building tornado shelters is not a simple DIY job. We highly recommend comparing at least 3 quotes from professionals so you can get the best value for your money. This varies not only from state to state but city to city. As the tornado shelter is dug into the ground, there are other utility poles, water lines, and electrical connections which may need to be cleared. Because of this, you need proper authority to install the shelter. You can expect to pay anywhere from $200 to $500 for the permits and regulation inspections before you can even begin the installation process. The location of tornado shelters can have a very large role in the final cost. It needs to be close to the home so you can easily access it but it also needs to be at least 10 feet away. The reason being, if the home is damaged and falls down, you don't want it landing on the shelter or blocking your exit. The terrain around the home plays a big factor as some areas are just far more difficult to dig into. The larger the construction, the more it is going to cost. You need to have at least 10 square feet of floor space, although many people do like to add even more. When installing a tornado shelter, you more or less are installing an entirely new room/basement onto your property. Because of this, you need to plan accordingly. You can expect to pay an average of around $9,300 for a tornado shelter. However, the entry level cost to build a tornado shelter begins at around $5,000. Of course, if you want something larger and you decide to go with a more elaborate design plan, you can see costs increase upwards of $25,000. Keep all of this in mind when going through the design and planning process. 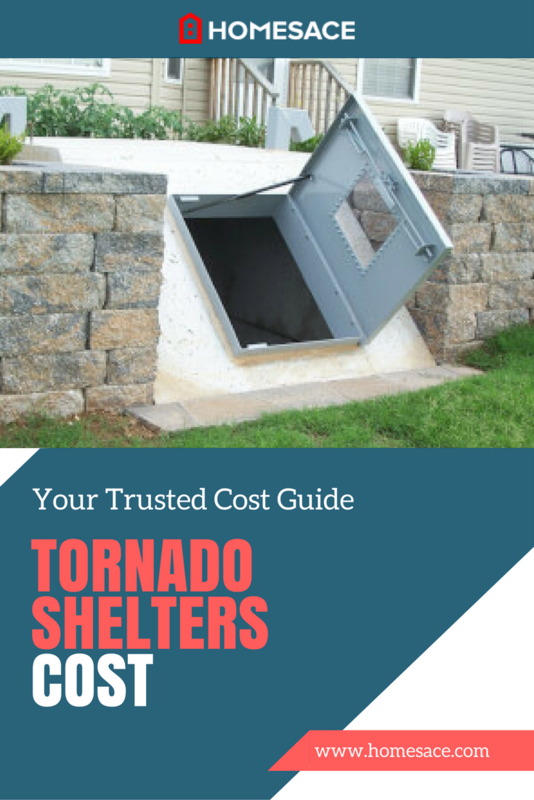 With these price point considerations, you'll have a much better understanding of what it is likely going to cost to build a tornado shelter on your property. If you want help installing a tornado shelter, simply enter your zip code in the space provided. We will connect you with the top contractors in your area. They can assist you with an accurate, localized estimate for installing tornado shelters. This way, you'll receive the very best price estimate in the city where you live. The best part is, it's 100% FREE and there's zero obligation to purchase anything.